The Residence lies in a quiet and sunny area, 80 m. from the centre of Vigo di Fassa ( 1400 m. - 1080 inhabitants ), 150 m. to the Catinaccio Cableway to Ciampedie (2000 m.). The stays begin at 5 p.m. and end at 10 a.m. There are 9 skiing zones in the Val di Fassa and they are spread over the Fassa and Carezza ski area. Then there is Moena, which is part of the Trevalli ski area (Lusia – San Pellegrino – Falcade). 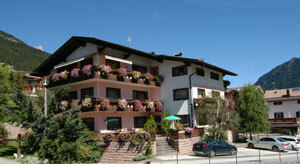 The slopes and lift facilities in the Val di Fassa are part of the famous Dolomiti Superski area. QC Terme group has selected the evocative setting of the Trentino Dolomites overlooking Pozza di Fassa for its new spa center. QC Terme Dolomiti stands out for its internal comfort and external qualities thanks to the use of local and recycled materials, as well as having been established inside a green area with the utmost respect for the environment. The love story between QC Terme and high altitudes bears witness to the central role that nature plays in modern-day spas, assisting in the cure of contemporary ailments through alpine balneotherapy. The spa spans three floors (a total of 4,300 square meters), in addition to outdoor swimming pools and areas for enjoying "Forest bathing". Thanks to QC Terme's experience in the spa sector, this location will offer the most innovative wellness services in a modern setting, in agreement with environmental sustainability, and will be supplied with the precious thermal water from the Alloch source. At QC Terme Dolomiti you will be able to enjoy a wide range of spa treatments: Jacuzzis, Kneipp treatments, waterfalls, Japanese bath, steam baths, saunas and bio-saunas, salt rooms and relaxation areas. We focus particularly on a broad selection of massages as well as offering various gourmet experiences daily, such as a delicious lunch buffet and the "Aperiterme", an evening aperitif.